Fig. 1 - Constellation of metal tubes. Look at the black tracks. Apparently rain drops fall down on the tube and create these dirt tracks while on their way down. All tracks converge to the gray strip. Fig. 2 - Close up of Fig. 1. The tube at the left is a different one than above and oriented vertically, to ease analysis. The blue track at the right resulting from theory resembles the track shape quite well. Note that it starts at the top at a position at the 'back' of the tube, visible in the plot right but invisible in the picture left. Surprisingly, it turns out that the track resembles the plot of a tangent function. Straight lines, parabolas, circles, ellipses, sines, exponential functions and others - I know where one can literally see them in the real world. To my knowledge this drop track is the only example of a tangent function coming to life. Let's proceed to sketch the proof of this. I used the Lagrangian formalism to solve the problem. This formalism is a generalization of Newton's laws. It allows one to use a suitable coordinate system, to handle constraints and to include frictional forces. For the latter I used a force which is linearly proportional to the speed of a drop. This is probably wrong, nevertheless it gives the reasonable result of above. Possibly the solution is not very sensitive to the type of friction one uses, as long as it leads to a constant velocity. Experiments show that drops move at a constant speed over an inclined surface. c1= -mgcos(theta)/k; m= drop mass [kg], g= gravitational acceleration (~9.8 m/s²), the frictional constant [kg/s], theta= the angle of the tube symmetry axis w.r.t. the direction of the gravitational force [deg]. c3= defines phi at t= 0 s.
Apparently the drop travels at constant speed c1 in the -z-direction, down the tube. No acceleration, hence no net force is excerted on the drop. This occurs because the frictional and gravitational force cancel each other.This is similar to a snow flake that falls at constant speed during quiet winter weather. Fig. 3 - Tube pictured such that it appears to be vertical (left) and the theoretical result (right). Due to the rotation the gravitational force is directed parallel to the vector pointing from (0, 0, 0) to (0, 1, -1). I.e., the force vector points towards the reader, down right. Fig. 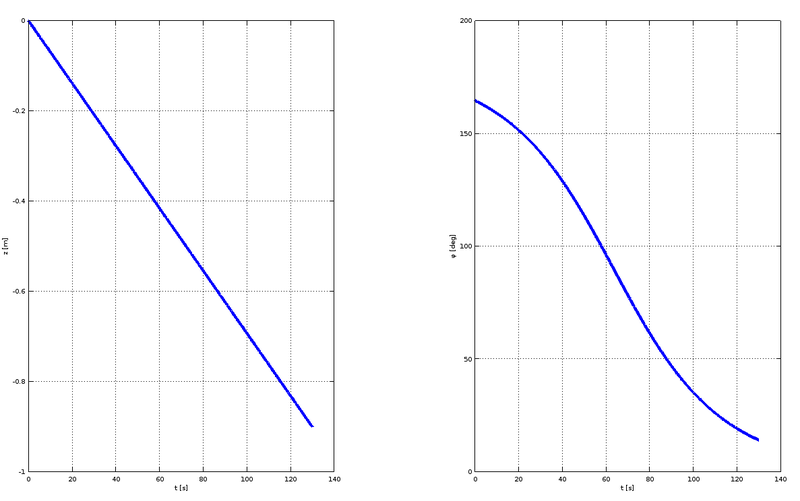 4 - Plot of the cylindrical coordinates z (left) and phi (right) as a function of time t.
The blue curve of Fig. 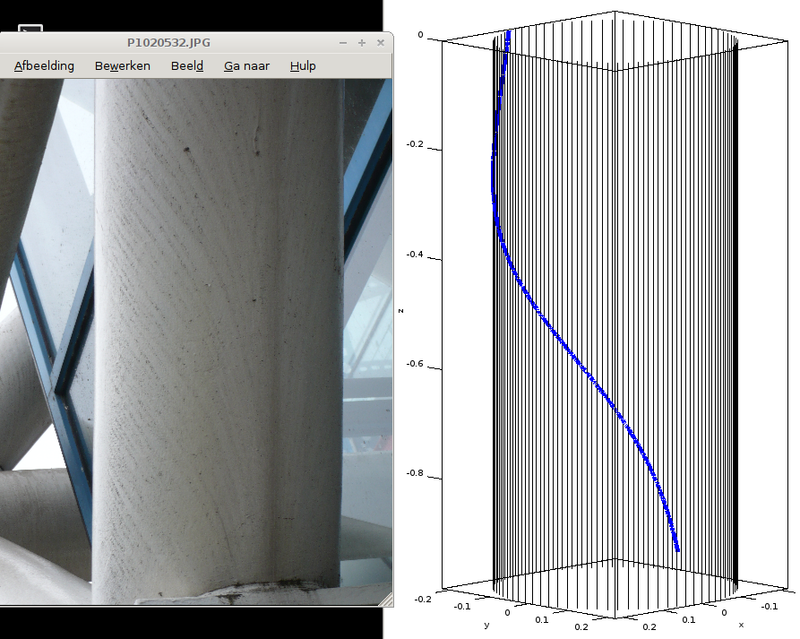 2 (right) results from transforming these to (x, y, z) coordinates and plotting the result. phi asymptotically approaches 0 degrees. This corresponds to the dark band of Fig. 1 (left)where all drops converge to. Note that one can recognize the tangent function in the right plot. This is due to the fact that atan(exp(t)) is approximately equal to a shifted and scaled version of atan(t) and hence the two have nearly the same shape. Because z is proportional to t, the track of drops on a tube thus resembles the tangent function. Check for yourself in the right plot of Fig. 3. As said before, this is the only case I know of where this function is visible in the real world. A note on programs: I used Wolfram Alpha (https://www.wolframalpha.com/) to solve the differential equations and Octave (https://www.gnu.org/software/octave/) on Linux Mint (http://www.linuxmint.com/) to visualize the solution. The best things in life are free (https://www.youtube.com/watch?v=-GoYa1uNhYs)!